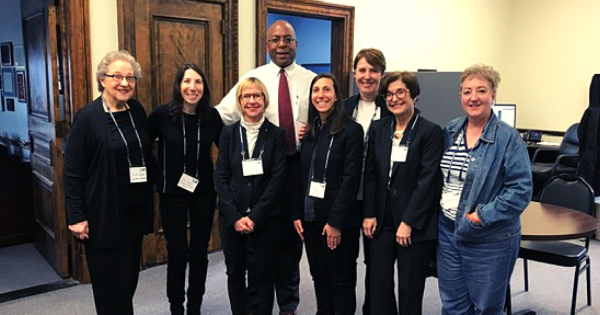 On Monday, April 8, Shaaray Tefila joined other New York reform synagogues for RAC-NY’s first lobbying day in Albany, where they lobbied in favor of The Green Light NY Bill (A3675/S1747). If enacted, this law would allow all New Yorkers to obtain drivers’ licenses, with or without a social security number, increasing the number of licensed and insured drivers on the roads and thus making it safer to drive in New York. Additionally, the law would provide those undocumented residents of New York an opportunity to possess necessary identification to enter government and corporate buildings (including schools to attend parent-teacher conferences), and the ability for them to drive to and from work with a license, thus removing any pretense for authorities to detain or arrest them for minor traffic violations.